These abstracts should be attached and emailed to the work-shop secretary (kristien.suenens@kadoc.kuleuven.be) no later than 1 February 2018. You should receive a confirmation of proposal receipt within 48 hours. The proposals will be evaluated and selected by the Scientific Committee based on topic relevance, innovativeness and the degree to which the proposal answers the call. Notification of the evaluation will occur no later than 1 April 2018. Full papers should be sent to the workshop organizers no later than 1 October 2018. 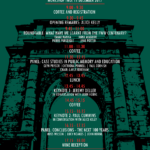 This interdisciplinary seminar series ‘Cultures and Commemorations of War’ brings together early career researchers and advanced scholars working on the memory of war in a range of disciplines with practitioners, policy makers, charities, and representatives from the media and culture and heritage industries. Through a series of three one-day workshops held in Oxford and London in 2017-18, this series aims to foster an interdisciplinary dialogue about the history and nature of war commemoration across time and its cultural, social, psychological and political iterations. This second workshop will consider the ways that we remember the First World War, focusing on recent commemorative projects as case studies of war commemoration and memory making. 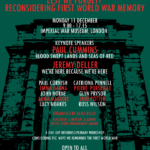 The keynotes in the afternoon are Paul Cummins, the artist behind the poppies at the Tower of London, and Jeremy Deller, who devised We’re Here Because We’re Here (https://becausewearehere.co.uk/). Here’s a 2014 video about making the poppies and a 2017 video about the poppies at Plymouth Hoe on the Poppies Tour (#poppiestour). The schedule and poster are below. Registration is £15 (standard) and £10 (concession) and includes lunch, coffee and a reception. 9.45-11: Roundtable: What have we learnt from the FWW Centenary? The History Department at Virginia Tech seeks applicants for a tenure-track position at the rank of assistant professor to begin in August 2018. Geographical focus and chronological period are open. We particularly encourage applicants who take a War and Society approach to military history, covering such topics as the social, cultural, political, technological, and economic dimensions of warfare; civilian-military and homefront-battlefield relations; the impact of war on soldiers, civilians, veterans, and the environment; and the causes, commemoration, and consequences of war. Required qualifications include a Ph.D. in history or related field by the time of appointment; an ability to teach a survey course in modern military history and to develop new undergraduate and graduate courses; and a record demonstrating a promise of excellence in research and teaching. The successful candidate will be expected to make significant contributions to the department’s War and Society minor. S/he will also be expected to work effectively with a diverse community in support of Virginia Tech’s Principles of Community. Preference will be shown for candidates with experience related to the university’s transdisciplinary Integrated Security Destination Area; a commitment to the use of emerging technology and new media in teaching and research; the potential for obtaining external funding; and an interest in contributing to one or more of the department’s strengths in public history, race and gender, and the history of science, technology, medicine, and environment. The successful candidate will engage in transdisciplinary research, curriculum, and/or outreach initiatives with other university faculty working in Virginia Tech’s Integrated Security Destination Area. The Integrated Security Destination Area is focused on understanding and fostering a world in which individuals, institutions, and nations are secured by technology and social systems that follow ethical principles and promote values of social justice. Faculty working together in this area are bringing a transdisciplinary approach to the complex range of human and systems security challenges. Visit provost.vt.edu/destination-areas.html for more information about Destination Areas. The Carnegie Foundation classifies Virginia Tech as a university with “very high research activity,” and the History Department also has a strong record of excellence in teaching. The normal teaching load in the History Department is two courses per semester. Members of the department work closely with faculty in transdisciplinary programs, including Women’s and Gender Studies, Africana Studies, Science and Technology Studies, ASPECT/Alliance for Social, Political, Ethical, and Cultural Thought. The department houses the Virginia Center for Civil War Studies (civilwar.vt.edu). Located in the town of Blacksburg, Virginia Tech is the largest state-supported university in Virginia. Blacksburg, between the Blue Ridge and Allegheny mountain ranges, was voted a Top 10 “dream town” for outdoor activities by Outside Magazine, and declared the “Best Place in the U.S. to Raise Kids” by Bloomberg Businessweek. Virginia Tech does not discriminate against employees, students, or applicants on the basis of age, color, disability, gender, gender identity, gender expression, national origin, political affiliation, race, religion, sexual orientation, genetic information, or veteran status; or otherwise discriminate against employees or applicants who inquire about, discuss, or disclose their compensation or the compensation of other employees, or applicants; or any other basis protected by law (http://www.vt.edu/about/equal-opportunity.html). For inquiries regarding non-discrimination policies, contact the Office of Equity and Access at 540-231-2010 or Virginia Tech, North End Center, Suite 2300 (0318), 300 Turner St. NW, Blacksburg, VA 24061. Virginia Tech encourages applications from women, minorities, veterans, and people with disabilities. The university also responds to the needs of dual career couples and has a variety of policies in place to provide flexibility for faculty careers. Candidates must apply online at http://listings.jobs.vt.edu/postings/80695 and provide a letter of application, CV, an article-length writing sample (upload under “Other Doc”), a 1-2 page statement of teaching philosophy, a 1-2 page statement describing the applicant’s interest in and/or experience working with diverse groups and under represented populations (upload under “Doc 2”), and contact information for three references, who will be invited to submit their letters of recommendation online. Review of applications will begin on December 1, 2017. The transnational research group “A Global Network for Global History” directed by the Centre for Modern Indian Studies (CeMIS), University of Göttingen in cooperation with the International Institute of Social History, Amsterdam, and the Weatherhead Initiative on Global History, Harvard University, Cambridge MA, advertises two Postdoc fellowships for the funding period from 16 January – 30 September 2017. The “Global Network for Global History” is funded by the VW foundation and seeks to organize a community of scholars interested in the systematic scrutiny of developments that have unfolded across national, regional, and continental boundaries and who propose to analyze the interconnections – cultural, economic, ecological, political and demographic – among world societies. Fellows at CeMIS are appointed for 8.5 months and are provided time, guidance, office space, and access to the facilities of Göttingen University. They should be prepared to devote their entire time to productive scholarship and may undertake sustained projects of research or other original work. They will join a vibrant interdisciplinary community of scholars at CeMIS and the newly founded Forum for Global and Transregional Studies at the University of Göttingen. The scholarship is granted for 8.5 months and amounts to EUR 2.650 per month (incl. compulsory health insurance and travel allowances). The work location is Göttingen. Applications should contain a full CV, copies of relevant examinations, a research proposal (max. 5000 words), a writing sample (a chapter or essay), and the names and addresses of two referees. They should be sent electronically by 31 July 2016 to Prof. Dr. Ravi Ahuja. The Journal of History and Cultures (JHAC) is inviting postgraduates and early career academics to submit articles or book reviews for its next issue. JHAC is a peer-reviewed online journal dedicated to pioneering new research in history and cultures. Drawing on the latest historical, cultural, political, social, and theoretical analytical research, JHAC’s overarching purpose is to foster lively and productive academic debate. We welcome articles on a broad range in both geographic and chronological terms, including local, regional, national and/or global foci from medieval right through to contemporary periods. Submissions should be emailed to jhac@contacts.bham.ac.uk by no later than 27th June 2016. Please ensure that you have included all relevant contact information, including your name, the title of your manuscript, your professional or institutional affiliation and a permanent e-mail address. Globalising and Localising the Great War is a project based at the University of Oxford which aims to bring together scholars who are working on the War from a variety of different perspectives. Its fundamental objective is to ensure that the commemoration of the War produces ground-breaking new research and fresh insights that challenge, rather than confirm, our often clichéd perspectives on an event that shaped – and continues to shape – our world. It is fundamentally interdisciplinary in its methodology and aims to encourage scholars from different fields and backgrounds to broaden their approaches to writing histories of the First World War. Papers should be designed to be approximately 20 minutes in length. We particularly invite submissions from postgraduate students and early career researchers. To apply, please send a 200 word abstract with your approach in the subject line to glgw.gradconference@history.ox.ac.uk by Friday 30th January 2015.